No brand operating in ecommerce should ignore the advantages the social media brings for business. Using social media accounts for marketing purposes significantly decreases abandonment rate and attracts new customers through non-standard activities. Facebook Widget is one of the instruments to convert the audience you have online to your store customers. Let your customers know about everything that might be interesting for them, from discounts and sales to news and announcements. Set up another way of communication with the people who visit your shop and tell them about your latest events in the compact form of the Facebook feed. Facebook is great tool for raising consumer awareness and monitoring what customers are excited about at the moment. People love to share opinions and leave rankings of any kind, if there is a fast and comfortable way to do so. Facebook widget allows your site visitors to have immediate access to all perks of your brand’s Facebook page, and you are able to see their activity raising. Encourage both your loyal and potential customers to give you a fuller review on your work and products. Facebook Widget is easy to use, has familiar user-friendly layout and features a plenty of customizable options. You don’t need to sign in one more time to use the extension. Facebook Widget requires only the URL of the page and its privacy settings to be set on publiс mode for the posts to be displayed correctly. Once you enable the Facebook extension, you get access to multiple storefront options. 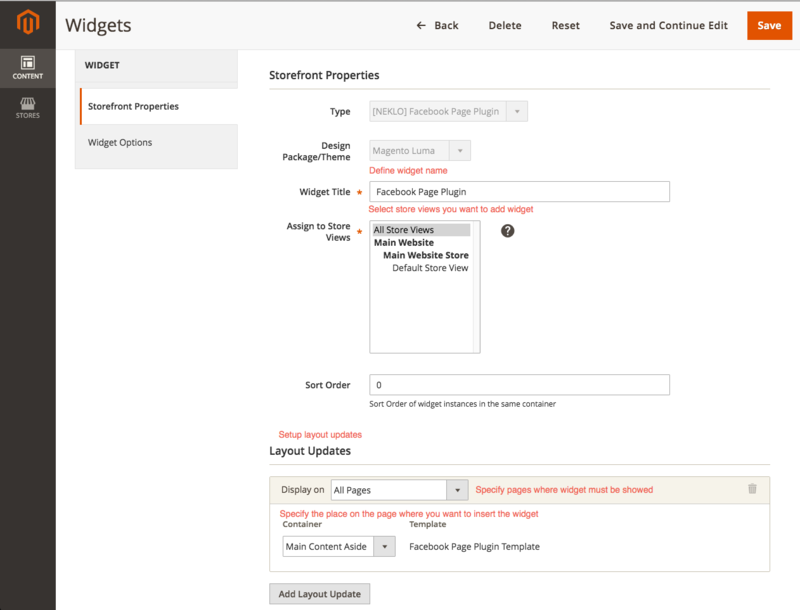 You can define widget name, select store views to assign the widget, and change the dimensions of the widget for the layout of your store. 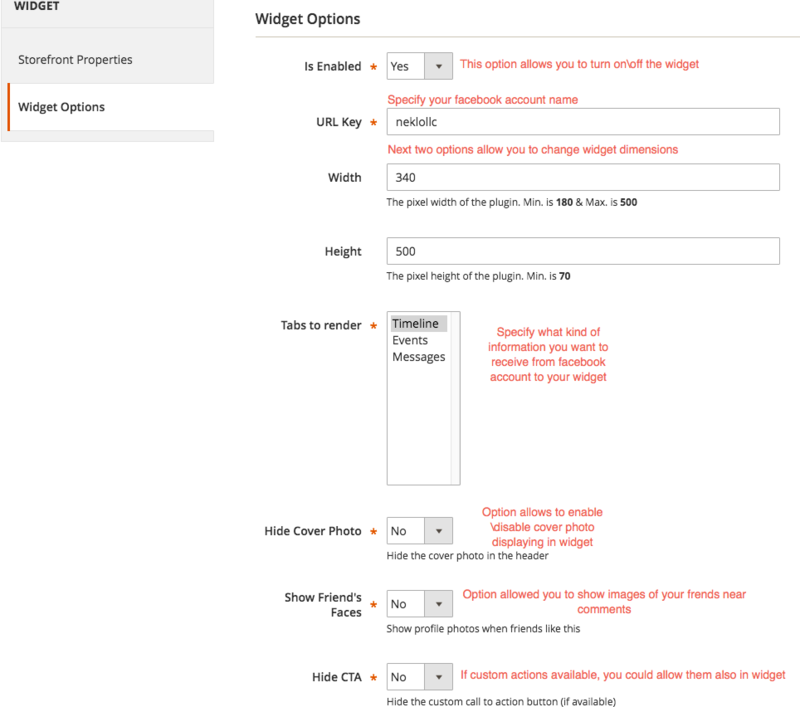 Choose what kind of information you want to be displayed in the widget from the Facebook page. The Facebook updates can be displayed as posts by certain hashtags or the posts from a certain page. Other widget options allow you hide or show the cover photo, enable or disable profile pictures in the comments and display custom СTA button if such is available. 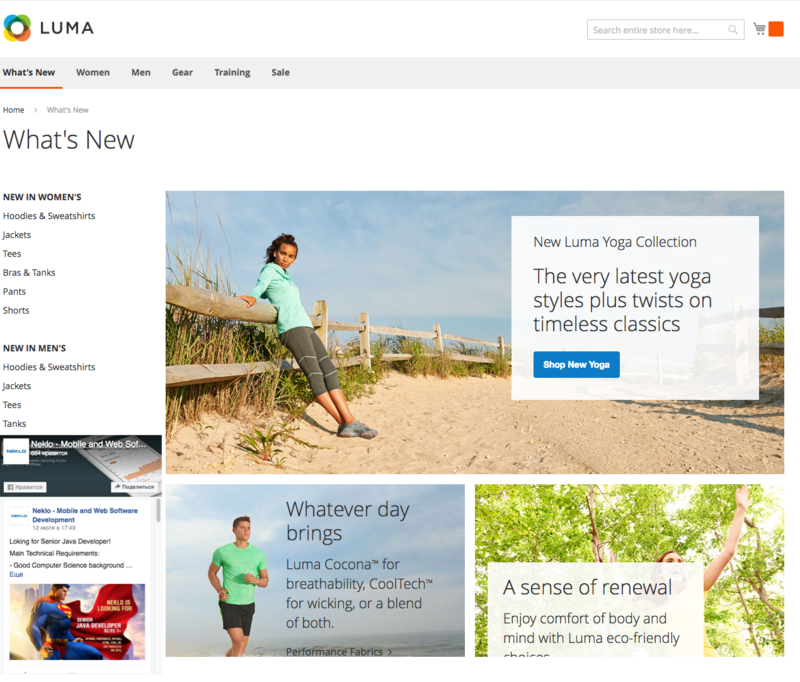 Facebook extension upgrades your store with an operating news feed, featuring all the necessary Facebook attributes, such as comment, share and like options. As the timeline is being scrolled down, older posts are loading automatically. Integration of your Facebook activity into the daily life of your store can greatly affect your customer reach and make your store layout more appealing. Become closer to your customers by letting them know your brand better through both formal and informal interaction on the largest social media platform.